Rehov (Hebrew: רחוב) is a moshav in northern Israel. Located four kilometres south of Beit She'an, it falls under the jurisdiction of Valley of Springs Regional Council. In 2017 it had a population of 399. The moshav was established in 1951 by immigrants from Kurdistan and Morocco. The name was taken from the ancient city of Tel Rehov, which was located in the area. It is located on the land of the depopulated Palestinian village of Farwana. ^ Khalidi, Walid (1992). 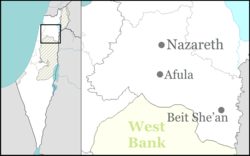 All That Remains:The Palestinian Villages Occupied and Depopulated by Israel in 1948. Washington D.C.: Institute for Palestine Studies. p. 47. ISBN 0-88728-224-5. This page was last edited on 21 April 2017, at 18:39 (UTC).